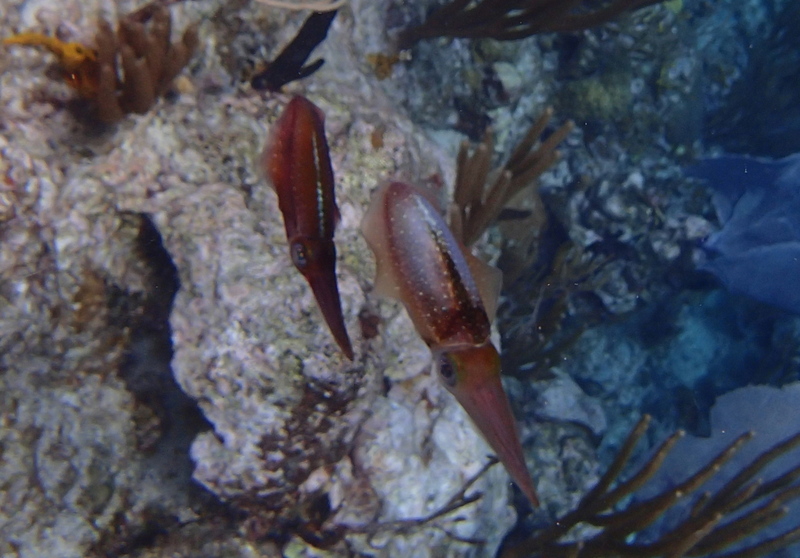 Each year during our Caribbean programs in Belize and the British Virgin Islands, our group is invariably drawn to the Caribbean Reef Squid, Sepioteuthis sepioidea. Even seasoned snorkelers become overwhelmed by the explosion of colorful activity found on a coral reef. Suspended in blue water, an erie feeling that something is watching you creeps into your consciousness. A quick glance around reveals a squadron of reef squid. Swim away and they follow. Move towards them and they quickly change color, a deep red if near the reef or pale if over sand, masters of camouflage. They may even create false eyes on their posterior end as seen here. The eyes will instantaneously vanish once the threat of a predator is gone. Quite incredible. The picture below reveals an unusual white blotch across the dorsal side. I have watched reef squid for decades and have rarely seen such coloration. It appears as though we may have interrupted the amorous intentions of a courting male. 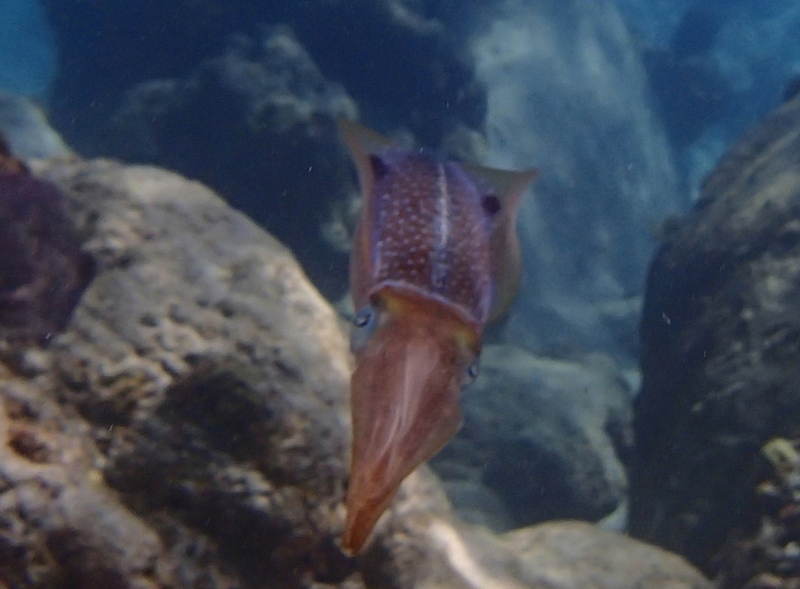 Reef squid not only expand and contract the chromatophore cells embedded in their skin to conceal themselves, but do so as part of their mating ritual. Males may flash an impressive zebra pattern to the female who is revealing a blotchy saddle indicating her sexual receptivity. Mate selection is a serious business to a female reef squid. She will die soon after depositing her fertilized eggs in a safe corner of the ocean floor. 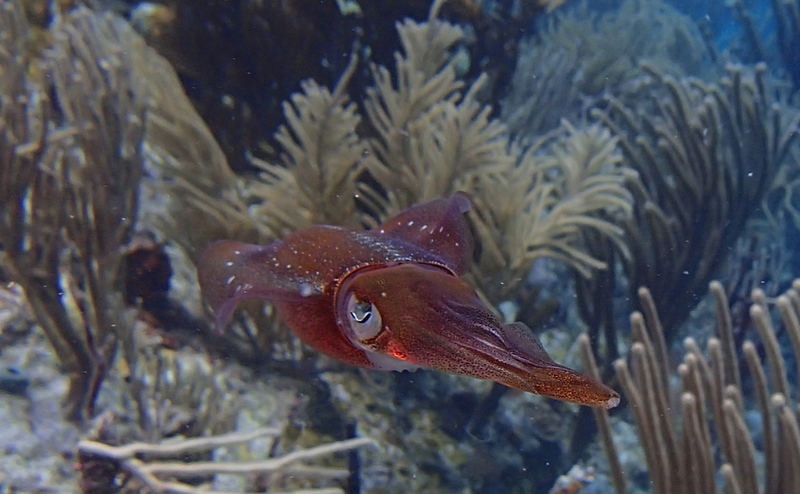 Like most cephalopods, the life of the Caribbean Reef Squid is relatively short. They are thought to live for one year, mate and die. Join Blue Water Ventures on a naturalist-led adventure to the reefs, rain forest, kelp beds and beyond!